Pierre Curie was born in Paris on May 15, 1859. Educated by his father, a doctor, Curie developed a passion for mathematics at the age of 14 and showed a particular aptitude for spatial geometry, which was later to help him in his work on crystallography. Matriculating at the age of 16 and obtaining his licence ès sciences at 18, he was in 1878 taken on as laboratory assistant at the Sorbonne. He gained his Licenciateship in Physics in 1878 and continued as a demonstrator in the physics laboratory until 1882. In 1895 he obtained his Doctor of Science degree and was appointed Professor of Physics. He was promoted to Professor in the Faculty of Sciences in 1900. His early studies were on crystallography. The problem of the distribution of crystalline matter according to the laws of symmetry was to become one of his major preoccupations. Together with his elder brother Jacques, they observed that an electric potential was produced when mechanical pressure was exerted on a quartz crystal such as the Rochelle salt (sodium potassium tartrate tetrahydrate, KNaC4H4O6·4H2O). While the Curies correctly predicted that a voltage difference could be produced from an applied stress on piezoelectric materials, they did not predict the reciprocal behavior of the materials. The reciprocal behavior is just a mechanical stress in response to a voltage difference. This property of reciprocity was mathematically produced from thermodynamic principles by Nobel physicist Gabriel Lippman in 1881. Shortly afterwards, the Curie brothers verified the reciprocity. They named the phenomenon piezoelectricity. Later, Pierre was able to formulate the principle of symmetry, which states the impossibility of bringing about a specific physical process in an environment lacking a certain minimal dissymmetry characteristic of the process. Further, this dissymmetry cannot be found in the effect if it is not preexistent in the cause. He went on to define the symmetry of different physical phenomena. Later, he turned his attention to magnetism. He undertook to write a doctoral thesis with the aim of discovering if there exist any transitions between the three types of magnetism: ferromagnetism, paramagnetism, and diamagnetism. In order to measure the magnetic coefficients, he constructed a torsion balance that measured 0.01 mg, which, in a simplified version, is still used and called the magnetic balance of Curie and Chèneveau. He discovered that the magnetic coefficients of attraction of paramagnetic bodies vary in inverse proportion to the absolute temperature-- Curie's Law. He then established an analogy between paramagnetic bodies and perfect gases and, as a result of this, between ferromagnetic bodies and condensed fluids. 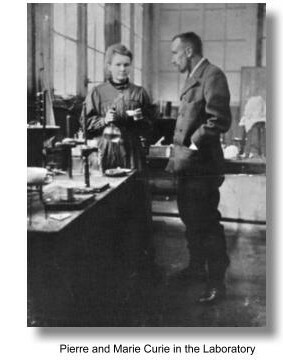 Curie's studies of radioactive substances were made together with his wife, whom he married in 1895. They were achieved under conditions of much hardship with barely adequate laboratory facilities and under the stress of having to do much teaching in order to earn their livelihood. They announced the discovery of potonium and radium by fractionation of pitchblende in 1898 and later they did much to elucidate the properties of radium and its transformation products. Their work in this era formed the basis for much of the subsequent research in nuclear physics and chemistry. Together they were awarded half of the Nobel Prize for Physics in 1903 on account of their study into the spontaneous radiation discovered by Becquerel, who was awarded the other half of the Prize. In 1903 Pierre Curie was also awarded the Davy Medal of the Royal Society of London and appointed professor of physics at the University of Parisin 1904, and in 1905 he was elected to the French Academy of Sciences. Such positions were not then commonly held by women, and Marie was not similarly recognized. Pierre's life ended on April 19, 1906, when he was run over by a horse-drawn cart. His wife took over his classes and continued her own research. In 1911 she received an unprecedented second Nobel Prize, this time in chemistry, for her work on radium and radium compounds. She became head of the Paris Institute of Radium in 1914 and helped found the Curie Institute. Marie Curie's final illness was diagnosed as pernicious anemia. She died in Haute Savoie on July 4, 1934 at the age of 66. 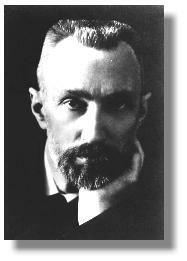 Pierre Curie's work is recorded in numerous publications in the Comptes Rendus de l'Académie des Sciences, the Journal de Physique and the Annales de Physique et Chimie.